Home BUSINESS NEWS County Government's New Order On Reserved Parking. County Government's New Order On Reserved Parking. Some reserved parking along Uhuru Street within Thika Town's CBD. Beneficiaries of reserved parking in Thika Town have been warned that they risk losing this privilege if they continued flouting the county government by-laws on the same. In a letter dated 8th September 11, 2017 by the Sub-County Planner Onguso Maina, this group of customers have been directed to remove the ‘Reserved Parking’ signboards from the designated parking lot immediately after 6pm every day. “It has come to our attention that you are contravening the 8am-6pm reserved parking condition to include hours after 6pm. You are directed to remove the signboards from the parking the parking immediately after 6pm, failure to which it will be confiscated by the Thika Sub-County and your reserved parking revoked for the remaining period,” read the circular that was sent to all the clients benefiting from this service. While confirming about the circular via phone, Mr. Onguso said that his office had received numerous complaints from the residents that these customers have been re-renting the spaces to other users contrary to the agreed contract with the county government. “Some of them are collecting money from other residents in the evenings and at night in order to allow them use the facility which is against our agreement with them. No one is permitted to charge any parking lot without the approval of the county government. In fact, none of these sign boards should be there after 6 o’clock in the evening,” said Onguso. Onguso warned that any one found contravening this law will lose that privilege and may have it difficult in case they apply to renew it again. The demand for parking especially within the CBD has been on an upward trend due to an increase in vehicles in the recent times. The idea of reserved car parking came into existence to enable business people access their premises and provide parking to their clients due to vehicle congestion in town. This privileged facility enables traders to effectively utilise their parking space and reduce traffic congestion attributed to vehicles looking for parking space. 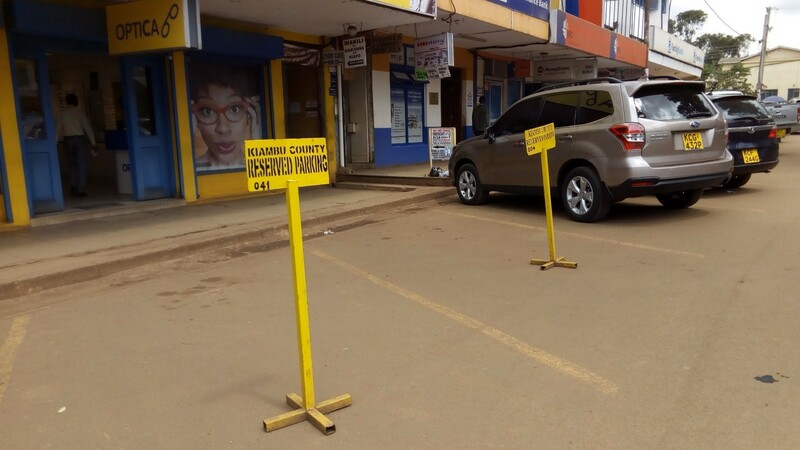 However, night guards have used the absence of county authorities at night to re-hire these spaces to desperate motorists looking for parking spaces.